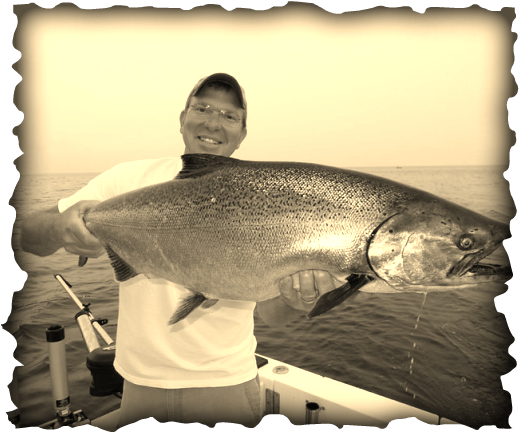 Book Your Lake Ontario Fishing Charter today! Troy Creasy is a full-time dedicated professional, pursuing trout and salmon for 28 years, with 25 years guiding experience. He is on the water year round and will provide you with a complete charter service. HIGH ADVENTURE SPORTFISHING is proud to use only the best equipment available. Captain Troy is a member of the Mustad, Maxima, Pautzke Baits, Atomik, Pro-Troll & Shark Downrigger weights Pro Staff. Captain Troy has been very active in the Fish community since 1987. He has served as president of the Oswego County River Guides Association. He is a member of the NYS Fisheries Congress, Lake Ontario Sportfishing Promotion Council, Eastern Lake Ontario Salmon and Trout Association and the New York State Writers Association. He is also an editor for Lake Ontario Outdoors magazine, a quarterly publication promoting outdoor sports in the Lake Ontario region. Whether you are looking to troll for trout & salmon, walk the streams, drift the rivers, fly fish, float fish, jig for walleye or spend some time in Florida fishing the backwaters of Pine Island Sound. Captain Troy is your go to guide for all of your fishing adventures.